Officials are investigating why more than 1,000 birds - most of them dead - fell out of the sky in the US state of Arkansas on New Year's Eve. The Arkansas Fish and Game Commission (AFGC) said it began receiving reports of the falling birds at about 2330. By midnight, more than 1,000 red-winged blackbirds had fallen in one area of the city of Beebe. The birds could have been hit by lightning or high-altitude hail, said AFGC ornithologist Karen Rowe. 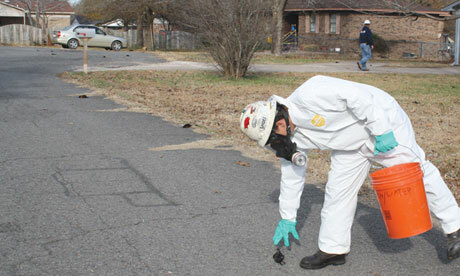 About 65 dead birds have been sent off for scientific analysis to determine the cause of death. It does not appear as though the birds were poisoned, Ms Rowe said. "Since it only involved a flock of blackbirds and only involved them falling out of the sky, it is unlikely they were poisoned, but a necropsy is the only way to determine if the birds died from trauma or toxin," she said. However, the AFGC did not say whether the blackbird deaths could also be attributed to the storms. City authorities have hired a specialist waste-disposal firm to collect the dead birds from gardens and rooftops, and dispose of them. Dead Birds Now Found In Sweden: What in the World is Going On?